If you’ve never cruised before and aren’t sure whether you’ll like it or not, try the 4-night cruise to start with. In my opinion, the 3-night is too short, and the 4-night includes a day at sea for you to relax and explore the onboard activities. If you decide you like cruising Disney-style you can go for a 7-night or longer next time! Book early. The earlier you book the cruise, the more you’ll save and better the room you’ll get. 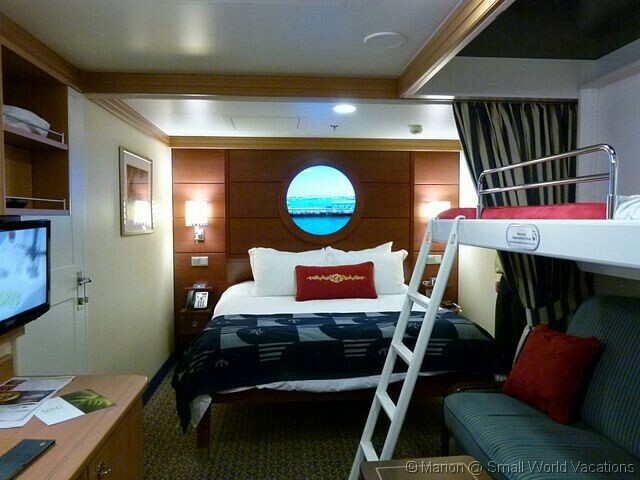 If you want a better room than you pay for, check out the “secret porthole” and “secret verandah” staterooms, but you’ll need to book early as there aren’t many! If you are a family of 5 or more, you can save money by booking two Category 9 or 10 connecting staterooms rather than one of the more expensive Category 4 or higher staterooms. Just make sure you request connecting staterooms when booking. Book with a Disney specialist travel agency. They’ll be able to get you the best possible deal and usually have onboard credit offers, giving you free $$ to spend onboard. Make advance reservations online. Check out our guide of when you’ll be able to pre-book things like Palo, Flounder’s Reef Nursery and excursions online, and stick to it. You’ll be in with the best chance of getting the reservations you want to and won’t have to worry about rushing to make bookings on embarkation day. Do online check-in prior to embarkation day. Fill in the online forms and pre-register a credit card which will save a bit of time at port. On embarkation day, try to arrive at Port before 11am. The earlier you arrive, the earlier you’ll get onboard and be first in line to make any remaining reservations. Take a carry-on bag with everything you’ll need, including a change of clothes for dinner if you’re on the main dining seating. Luggage is normally delivered to staterooms in good time, but just in case your bags don’t arrive in time for you to get ready. Also pack swimwear if you fancy a dip, as the pools are usually quiet on embarkation afternoon. Don’t miss the mandatory lifeboat drill. It’s a legal requirement and anyone who doesn’t attend will get in trouble with the Captain! For the sail away party, go up on deck 10 for a great view of the partying on deck 9. Look out for the Cast Members in the Port building waving goodbye to you with their giant Mickey hands! Read the Personal Navigator which you’ll find in your room each day. It lists every single activity for that day, character greeting locations, and opening times. Take a different colored highlighter pen for each person in your party then they can each highlight which activities they want to do on the Navigator. Extra copies of Personal Navigators are available from Guest Services. Make sure to note the dress code for the restaurant each night, which can be found on your Personal Navigator. Various presentations are held during the cruise, such as shopping and debarkation talks. There’s no need to attend these as they are repeated on the stateroom TV. Don’t wait until the end of your cruise to pay gratuities when everyone else will have the same idea and the line will be long! You can visit Guest Services at any time to pay them. The fast food places such as Pluto’s Dog House and Pinocchio’s Pizzeria are open for most of the day if you want a bite to eat between meals or late-night snack. Topsider’s (Magic) and Beach Blanket Buffets (Wonder) are open for breakfast, lunch and dinner each day if you don’t want to dine at one of the table service restaurants. 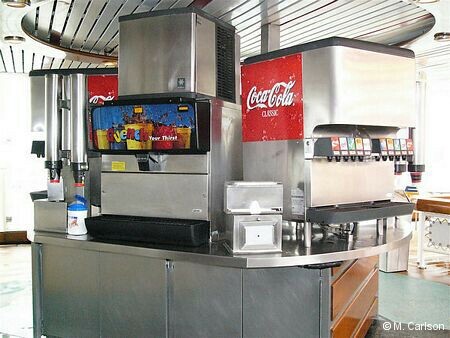 The self-service beverage station on deck 9 is open 24 hours a day and offers complimetary soft drinks as well as tea and coffee. Make use of room service – it’s free! Get breakfast in your room if you want to get an early start on port days. You can use stuff to take on excursions for lunch (soft drinks and bottled water cost). Sandwiches and cookies can be ordered and used to take for lunch on excursions, saving money on buying food in port. The only things you’ll have to pay for through room service are soft drinks, alcohol and snacks such as candy and popcorn. Buy a case of bottled water and take it onboard. Bottled water packages are available onboard but will cost much more than supermarket prices. On port days, if you’re not interested in that particular port or have visited before, stay onboard! It’ll be much quieter, the pools and spa are open, as are the snack places, and somewhere will be open for lunch. Activities and tours (such as the bridge tour) are also offered. When visiting ports, stick to the main tourist areas. Street crime is common in some places, with tourists being easy targets. Leave valuables onboard the ship in your room safe, and keep a very close eye on any you take ashore. Wear bags across your body and don’t put money or wallets in back trouser pockets. Before going to each port, write down the phone number of the ship’s agent, which you can find on that day’s Personal Navigator. Keep it with you in case of emergency if something goes wrong while you’re in port. On Castaway Cay day, I’d recommend getting off the ship as soon as you’re allowed to. You’ll get first pick of the beach chairs (& parasols! ), and if you’re interested in snorkeling, it’s best to do it early before the sand gets disturbed and vision reduced. If you do want to go snorkeling and have your own equipment, take it with you to avoid paying rental fees on Castaway Cay. Don’t forget that food and non-alcoholic beverages are complimentary on Castaway Cay. There’s a beverage station just near Cookie’s BBQ, which offers buffet lunch. If you don’t have any kids with you, escape to the adults-only beach on Castaway Cay. If you think you’ll want to buy photos taken onboard, buy one of the packages early on. They save a lot of money on individual prices and if, by the end of the cruise, you change your mind and don’t need the package you can get a full refund. Encourage your kids to take part in the Oceaneer Club and Lab, as they’ll get to attend a graduation ceremony at the end of the cruise, when they’ll receive a cute mouse ears mortar board. Last, but not least, check out our comprehensive guide to Disney Cruise Line, which will tell you everything you need to know about cruising with Disney, with menus, photos, stateroom details, and much more! So, you’ve decided you’re going to book a Disney Cruise, and after much deliberating have also chosen which itinerary you’re going to do. 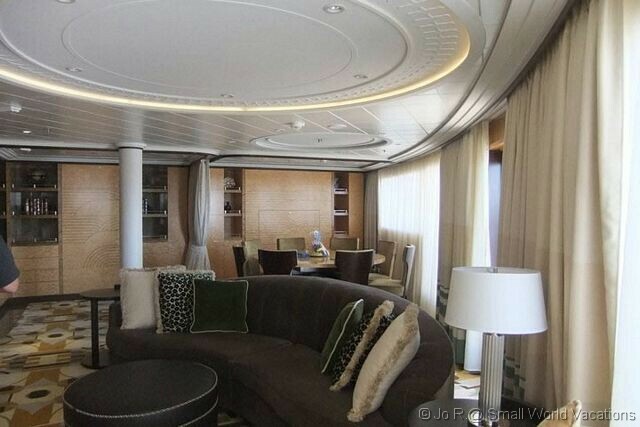 But what about staterooms? There are so many different categories, where do you begin? Well, the first decision is concierge or non-concierge? Concierge rooms come with several added benefits, the first of which is pre-arrival planning help. A Concierge Service Specialist will help you plan shore excursions and other reservations including Palo / Remy dining, and for the nursery. Once at port, concierge guests are given priority boarding, and can attend a private welcome reception once on-board. Concierge crew members are there to assist with on-board reservations and dining changes, celebration planning, and can help arrange for concierge guests to eat in their rooms instead of the rotation restaurants each evening. There’s also the private concierge lounge, which serves up complimentary snacks and drinks. If you opt for concierge and have a large amount of dollars to spare, you can splash out and book one of the suites. Alternatively, there are regular oceanview staterooms, all with verandahs, within the concierge bracket (on the Dream and Fantasy). On the Disney Magic and Wonder ships, concierge room choices are: Concierge Royal Suite (Cat R), Concierge 2-Bedroom Suite (Cat S), and Concierge 1-Bedroom Suite (Cat T). These suites sleep between five and seven guests. On the Disney Dream and Fantasy ships, concierge choices are Concierge Royal Suite (Cat R), Concierge 1-Bedroom Suite (Cat T), and Concierge Family Oceanview Stateroom with Verandah (Cat V). These suites and rooms sleep up to five guests. Follow the links for full details of the rooms. If you just want to opt for a regular stateroom, the next decision you need to make is verandah or no verandah? Verandahs are great for sitting on and watching the world go by. Imagine stepping out onto your own private balcony in a morning, and sitting down there to eat breakfast served up by room service! The luxury of fresh air does come at a premium though! You do also get a small amount of extra space with verandah rooms. There are two categories of Verandah rooms – Deluxe Family Oceanview with Verandah which sleep up to 5 guests, and Deluxe Oceanview with Verandah which sleep up to 4 guests. The Family rooms are slightly larger and have an extra pull-down bed, but are also higher on the price scale. From a safety point of view, which will be of particular interest to those with small children, the verandahs all feature solid railings which are higher than adult waist height. However, as there are chairs and a table on each verandah (which could be climbed on), I’d strongly recommend not allowing children on the verandah unsupervised. The doors out to the verandah do have sufficient locks on to prevent children letting themselves out. If sailing on the Magic or Wonder, you have the option of the Deluxe Oceanview with Navigator’s Verandah rooms, which feature an enclosed private verandah with large open-air porthole, so you’re still getting the fresh air, but it’s not fully open like a regular verandah. On the Dream and Fantasy, the Deluxe Family Oceanview rooms feature a large porthole window with built-in seating – perfect for cosying up on and watching as the ship sails into port. The family rooms (Dream and Fantasy), with or without verandah, have a round tub and shower in one room, and a toilet in a separate room. Whereas the standard oceanview rooms have a regular tub and shower, and separate room with toilet. 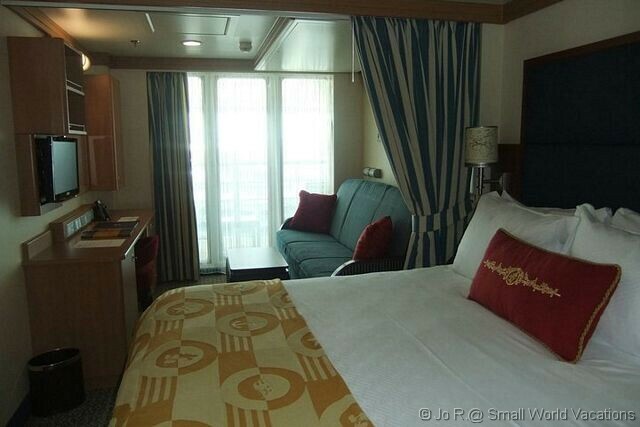 If you’re on a tight budget, and don’t mind doing without the oceanview, there are the inside staterooms. There’s so much going on on board the ships, you probably won’t spend much time in your staterooms anyway. 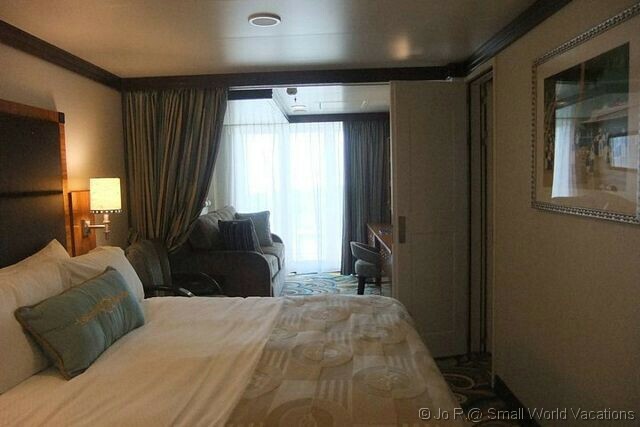 Choose from the Deluxe Inside or Standard Inside stateroom. The standard inside stateroom is much smaller than the deluxe inside, and although they officially sleep up to 4 guests, it may be a bit of a squeeze with so many. It’s also the only category just to have a single bathroom. You do get the added bonus of Magical Portholes on the Dream and Fantasy, with live views from the bridge, and special virtual visits from some of your favorite Disney characters. There are various sub-categories of room within each category, all priced differently. So it’s worth studying the details of each room that we have in our DCL staterooms section, which also features handy comparison charts so you can see the differences at a glance. 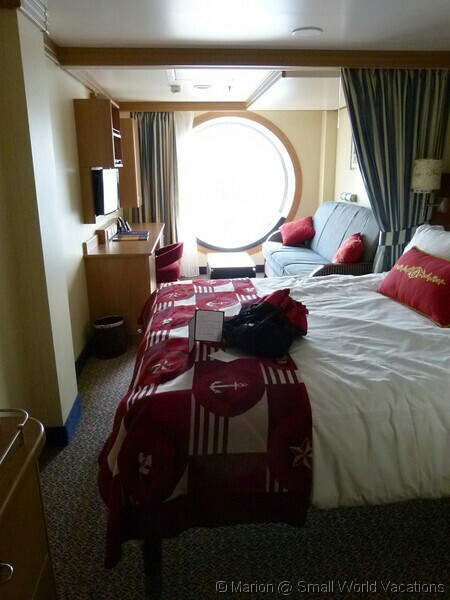 We’ve sailed in rooms with verandahs, but on our last cruise on board the Disney Dream we opted for a Deluxe Family Oceanview with the porthole window seat. With two adults, a 3 year old and an infant it suited us just fine, and we didn’t have to worry about our daughter climbing on the verandah.